Mayan weavings in a ceremonial display. Photo: Aisling Walsh.The fruit seller, the tortilla maker, the domestic worker, the nanny. These are the Marías of Guatemala. Indigenous women, who continue to wear traditional Mayan dress. They are seemingly considered undeserving, of an identity or even a name of their own; valued only to the extent to which they serve others. It doesn't matter if they are teachers, lawyers, academics or doctors, if they are wearing their Mayan huipil and corte they are considered part of the 'servile class.' Strangers have no shame in asking them to clean their houses. Yet, the clothing that marks them as a 'María' is admired when worn on the 'right body'. “Our clothes, when we wear them, are little better than trapos [rags],” Jovita Tzul Tzul, a Mayan lawyer supporting the national weavers’ movement, told me. “When they are worn by white bodies they become something beautiful,” she said. The ‘value’ of these textiles depends on who sells or wears them. Indigenous Mayan textiles are recognised internationally for the intricacy and vibrancy of their designs and quality of their weavings. Increasingly, their designs are being commodified and packaged for white tourists or clients in Europe and the US looking for a taste of ‘Mayan exoticism’. Backstrap weaving or Telar de Cintura is an art that has been passed down through generations. Each Mayan community has its own style and designs often reflect the history of that community or include sacred symbols. There are textiles for everyday use and others for ceremonial purposes. These clothes are made and used by women and men. But amid ‘macho’ gender stereotypes and racial discrimination there are few communities where men continue to weave or wear them. As such, it is principally Mayan women who preserve this art through their weaving and everyday use. Their weavings and livelihoods face significant threats – including from mass produced and low cost textiles that are running some out of business – while ladina (a local term for non-indigenous) women, designers and clothing companies are profiting off international interest in Mayan designs. The exploitation of Mayan weavers, and the appropriation of their art, is enabled by widespread racism and gender discrimination in Guatemala, a country that is still largely organised around racial stratification dating from colonial times. Mayan women have been amongst the most marginalised groups for centuries. Their bodies, labour and knowledge have been regarded as an exploitable as farm workers, wet nurses, sexual slaves, domestic servants and as weavers. Guatemala's history from the Spanish invasion more than 500 years ago has been marked by a constant process of pillaging and dispossession of indigenous land, territory and culture. Few aspects of life went untouched, though arguably Mayan weavings resisted this process to some extent. The María's are fighting back. They are calling out the racism of folkloric presentations using white actors dressed as 'indians'; white models dressed in indigenous clothing on magazine covers; and clothing companies using the name María in their titles to market indigenous textiles. 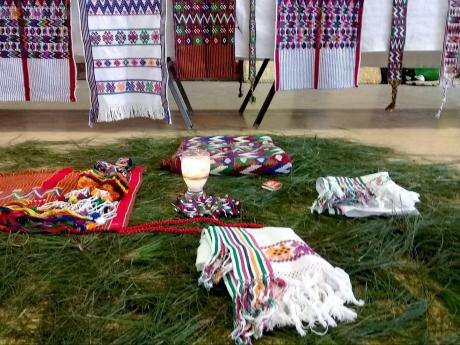 Through the national weaver’s movement, Mayan women are fighting for their collective intellectual property over traditional designs to be recognised and protected in law. Significantly, they are working to recover and re-dignify Mayan dress as a key part of their identity and cultural traditions. In doing so, they are challenging the systemic racism that has allowed white people to exploit and profit from Mayan women's art with impunity.